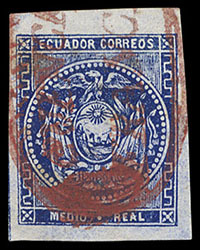 Ecuador, 1865, ½r Blue, two singles and horizontal pair; each bearing a red "Cuenca Franca" in oval pre-adhesive cancel; right stamp in pair with tiny thin, otherwise Very Fine, very scarce as this provisional handstamp was only used for a short time before the introduction of the new handstamps. Scott No. 2 Estimate $400 - 600. 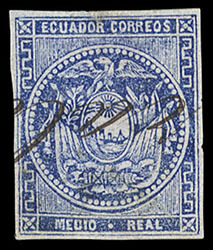 Ecuador, 1865, ½r Blue, three singles bearing fancy handstamps; includes red "Cuenca Franca" oval (stampless period), two strikes of fancy Chimbo flower circular handstamp tying to piece, and the Pelileo "wheel" found only on stamps from the first period printing, Very Fine. Scott No. 2 Estimate $250 - 350. 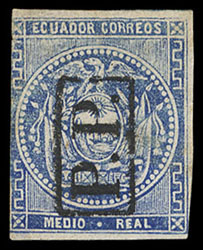 Ecuador, 1865, ½r Blue, full strike of boxed "P.P." handstamp of French origin, margins ample to in at left, a Very Fine strike, extremely rare with only two examples known, ex-Olgieser. Scott No. 2 Estimate $200 - 300. 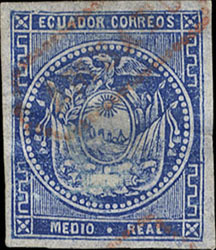 Ecuador, 1865, ½r Blue, with unknown straight line handstamp believed to be "(PO)RTOVIE(JO)", small flaws, F.-V.F. appearance, a unique usage of this straight line handstamp, ex-Olgieser. 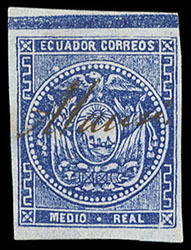 Ecuador, 1865, ½r Blue, partial strike of "Otavalo Franca" two-line handstamp, large margins, Very Fine, fewer than five stamps known bearing this provisional handstamp. 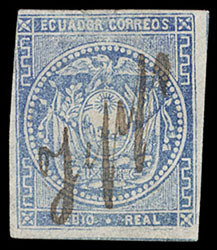 Ecuador, 1865, ½r Blue, four singles bearing manuscript cancels; with two different style "Cuenca", "Rio" of Riobamba (corner margin single) and pen cross, one with slight margin thin, otherwise Very Fine. Scott No. 2 Estimate $150 - 200. 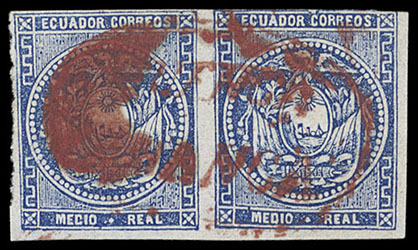 Ecuador, 1865, ½r Blue, three singles bearing provisional handstamps; includes Ambato in dotted hexagon in black and red and boxed Latacunga, first two with thins, F.-V.F., these stampless period postmarks where forced into limited use as the new postmarks, including date stamp, where not available yet to be used on the recently introduced stamps. 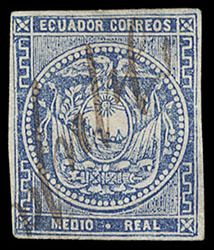 Ecuador, 1865, ½r Blue, manuscript "Jipp" for Jipijapa of Manabí Province, margins large to just in, couple small thins, Very Fine appearance, fewer than ten examples known of the Jipijapa manuscript. Scott No. 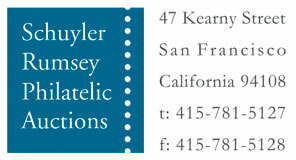 2 Estimate $100 - 150. 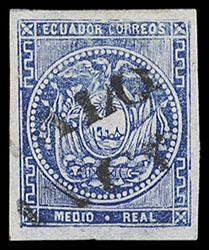 Ecuador, 1865, ½r Blue, manuscript "Jipp" for Jipijapa of Manabí Province, full margins, couple small thins, Very Fine appearance, fewer than ten examples known. 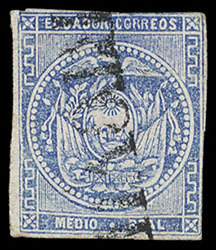 Ecuador, 1865, ½r Blue, manuscript "Babahoyo" cancel of Los Ríos Province, large margins with small margin nick at bottom, F.-V.F., a rare postmark with fewer than five examples known.